This week long trekking trip in Morocco culminates in the ascent of North Africa's highest peak, Jebel Toubkal (4,167m). Trek through the valley of Imlil, past Berber villages and over beautiful passes surrounded by panoramic views of the High Atlas Mountains. Morocco's famous Red City, Marrakech is the spiritual heart of the country, a cultural melting pot of the mountain Berbers and the desert peoples of the south. 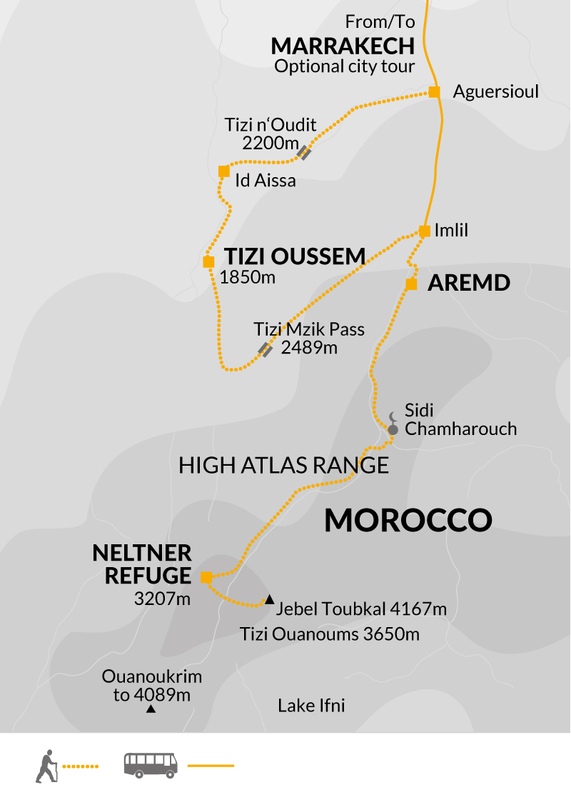 the High Atlas strongholds of the Berber tribes. Leaving Marrakech behind this morning we drive south, towards the Imlil Valley and the craggy peaks of the Toubkal Massif. At the village of Aquersioul (1,600 m) we begin our climb, hiking up into the Matate Valley and then on to Tizi n'Oudite (2,200 m), where we stop to enjoy a picnic lunch. Descending through a juniper forest into the Azaden Valley, we then continue towards Id Aissa, enjoying the views out towards the colourful mountain villages of Tizi Zougaghen and Tizaine as we make our way towards our final stop in Tizi Oussem (1,850 m). 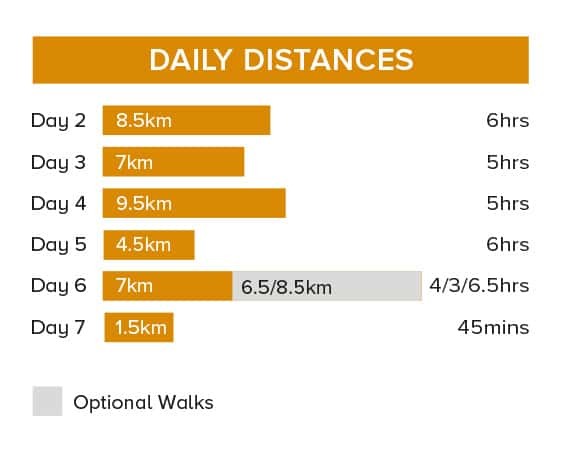 Today's eight-and-a-half kilometre walk is expected to take around six hours with a total ascent of 750 metres and a descent of 500 metres. After breakfast this morning we continue walking along the valley, before beginning a steady ascent up towards Tizi Mzik (2,489 metres). From this high mountain pass we then begin our descent towards the village of Aremd (1,950 m). Built on a moraine spur overlooking the valley floor, Aremd is the largest village in the valley and provides us with a fascinating insight into Berber life. This afternoon we have a chance to take a walk around the village, taking in its captivating mix of terraced farming, traditional gites and mountain landscapes. Today's seven kilometre walk is expected to take around five hours with a total ascent of 429 metres and a descent of 539 metres. Continuing along the Mizane Valley we cross the flood plain and follow the mule tracks up into the high rocky cliffs above the valley. Crossing the river we eventually come to the pastoral shrine of Sidi Chamharouch, set beside a small waterfall and a jumbled cluster of village houses clinging to the rock face. From here the trail continues to climb steadily, snaking and zigzagging its way up towards the snow-line and the welcoming sight of the Neltner Refuge (3,207 m). Today's nine-and-a-half kilometre walk is expected to take around five hours with a total ascent of 1,257 metres. Early this morning we make our attempt on the summit of Jebel Toubkal (4,167 m). Our route takes us up the south cirque, a steep climb across scree and rock that leads eventually to the Tizi n'Toukbal (3,975 m). Cresting the ridge it is then just a short walk to the summit. On a clear day the views from up here take in the Marrakech Plain and the High Atlas Mountains and stretch as far south as the Anti-Atlas and the Sahara. From the summit we head back down to the refuge for a second night. Today's four-and-a-half kilometre walk is expected to take around six hours with a total ascent of 967 metres and a descent of 967 metres. If conditions proved unfavourable yesterday, we have a chance to make a second attempt on Jebel Toubkal this morning. Alternatively there is an option for us to try an ascent of Ouanoukrim (4,089 metres) or to take a short walk out to Tizi Ouanoums to take in the views of Lake Ifni. This afternoon we then head back down to Aremd to spend another night in the village before we leave these mountain landscapes behind. Option a - 15.5 kilometre walk is expected to take around 10-11 hours with a total ascent of 882 metres and a descent of 2139 metres. Option b - 13.5 kilometre walk is expected to take around seven hours with a total ascent of 393 metres and a descent of 1650 metres. Returning on foot to Imlil this morning, we then drive back to Marrakesh where, on arrival, we have some free time to explore the city's colourful souks and perhaps take a stroll around its celebrated Djemma El Fna Square. A feast for the senses, the square is a wonderful confusion of noise and colour, where you will find the streets alive with storytellers, musicians, jugglers and water-sellers: the perfect place to haggle for some last minute presents, or just sit at a cafe and watch the spectacle unfold before you. Today's one-and-a-half kilometre walk is expected to take around 45 minutes with 210 metres of descent. Your trip ends today in Marrakech after breakfast. Depending on the schedule of your flights, you may have some additional time to wander in the souks of Marrakech or buy your last souvenirs before departure. The climate is both Mediterranean and Atlantic. The dry, hot season is from May to October when summer temperatures can reach 38°C and above (if sight seeing is included we will do our best to avoid the heat of the day during this period). Temperatures may drop significantly at times during the night as the day's heat rapidly diminishes. From December to January snow can be expected on mountain passes and it can be wet. In winter, day temperatures will probably be around 18-25°C, dropping to perhaps 0-5°C. Bring light and comfortable clothing that can be layered according to the temperature. The weather conditions in the mountains can be changeable, and it will be cold, especially at night, so bring warmer layers. Tops made from wicking materials which keep you drier and warmer are recommended as a base layer, and walking trousers are preferable to trousers of heavier material such as jeans. Morocco is a Muslim country and it is important to dress with respect for local customs. People may be offended by shorts or revealing dresses, which can attract unwelcome attention. We advise that in general both men and women should cover shoulders, upper arms and knees. Transparent, plunging necklines and tightfitting clothes should be avoided. Women should also cover their heads when entering a sanctuary, though in general, mosques are forbidden to non-Muslims. We recommend you bring walking boots with ankle support- leather or fabric are both fine. Make sure that your boots are worn-in and comfortable before the start of the trip. Also trainers or sandals for relaxing and general wear. We suggest that on international flights you either carry your walking boots in your hand luggage or wear them - should your luggage be lost or delayed, your own boots are the one thing that will be irreplaceable. Crampons - Bring your own if you have them or these can be hired locally for MAD300 (approx. £20) each for the duration of the trip. They can go on any type of walking boot. This is only applicable at the start (Apr- May) and end of the seasons (Oct) if there is late/early snow on the summit. Please advise us if you would like to hire this equipment locally so we may add a note to your booking. One main piece of baggage and and a 20-30 litre day sack is recommended. You will need to carry what you need for the day which may include a raincoat, jumper, camera, sun-cream and water. It is preferable to bring your luggage in soft holdalls rather than a large suitcase - as it is easier to pack them on the vehicles and the mules. Bring a 3-season sleeping bag (during May and Sept you will need a 4 season bag). A silk or fleece liner helps to keep your bag clean and adds an extra season. Sunglasses/ ski goggles and high factor sunscreen and lip protection- Essential for protection against UV rays and glare at high altitudes. Torch/Batteries/Bulb - A small torch is essential for finding things at night, a head torch is advised for the early ascent to the summit. Remember to bring some spare batteries. Reusable water bottle (minimum 1litre) - an insulated bottle is also nice to have for hot drinks. Personal first aid kit - On each walk a first aid kit is carried but you should have your own blister kit, supply of plasters, aspirin and other essentials. Please do not give medicines to local staff without consulting the tour leader. Although entirely voluntary, tipping is a recognized part of life in this region of the world. Some local staff will look to members of the group for personal recognition of particular services provided. Accordingly, you should allow approx. £25 per person for tipping of crew and local guides used. US Dollars, Sterling and Euros are readily exchangeable. We recommend you take a mixture of cash and credit cards. Scottish bank notes and Australian dollar travellers cheques and cash are NOT normally accepted in Morocco. Most major towns - your Tour Leader will advise you. ATMs are available in main towns/cities, though can be unreliable. Travellers cheques are difficult to exchange and are not recommended. Morocco is a developing country and as such, the accommodation standards are not equivalent to those in Europe and can be more basic. We generally choose our properties because of their location, cleanliness, traditional style or for their welcoming atmosphere, as we endeavour to provide an authentic Moroccan experience. However, some of the properties might have some outdated or simple furniture and the level of service may vary depending on the location. You may find that availability of hot water is variable or limited in certain locations. Breakfasts are generally continental style. For 2020 departures we have upgraded the hotel in Marrakech, located in the new city centre with a half hour walk to the main Jamaa El Fna Square. The hotel has a rooftop swimming pool and a restaurant, the rooms are air conditioned. Day two you stay at the The Tizi Oussem Gite which is on the edge of the village nestled in amongst other houses and buildings. Its built into a hillside so you enter on the second floor with a communal room, where you eat. The rooms are two-four bed/dorms. They have a large and very thick mattress on the floor. It's a rustic property with one shared bathroom (two showers and four toilets) but it is charming and the staff are lovely. On days three and six you stay at The Armd village house. This has a number of twin or triple rooms with shared facilities and a communal area for eatingocialising and roof terrace. All is bedding provided. These are a fantastic way to meet the local Berber people and gain an insight into their lives. On days four and five you stay at Neltner refuge. The rooms are basic dorm rooms with bunk beds (ear plugs recommended!). There is no bedding provided. There are shared toilet facilities (take your own toilet roll). There are showers, which may or may not be hot. There's a dining room and large lounge area with a wood burning stove (wood is extra), where everyone gathers and socialises in the evening. Please be prepared to pay extra for the hot showers, wood and bottles of water. It's a great way to meet like-minded trekkers from all over the world. Morocco: Visas are not required by UK, Australian, New Zealand, US and Canadian citizens. Other nationalities should consult their local embassy or consular office. Travellers with heart or lung conditions, anaemia, asthma, high blood pressure, or taking the contraceptive pill must seek the advice of their GP and specifically mention the maximum altitude the trip reaches (please refer to Tour Essentials box on front page of your Tour Notes). Please take these to your medical appointment so that your doctor has the full details of your trip. Nothing compulsory, but we recommend protection against tetanus, typhoid, infectious hepatitis and polio. Consult your travel clinic for latest advice on different prophylaxis available against malaria. Please check the latest requirements with your travel clinic or doctor prior to departure. The above is not an exhaustive list. Further information regarding vaccinations and travel health advice can be found by following the NHS and NaTHNaC links at Explore Travel Health and from your local healthcare provider. Visa and vaccination requirements are subject to change and should be confirmed by you before travelling. Trek for 5 days for an average of 4 to 6 hours per day, with optional additional trekking on day 6. Maximum altitude 4,167m. Paths generally well-defined rocky mule tracks. The Toubkal ascent/ descent is on uneven paths with scree in places. Please be aware that there may be snow on the summit particularly at the beginning (April-May) and end (October) of the season. What is it like to climb Toubkal?